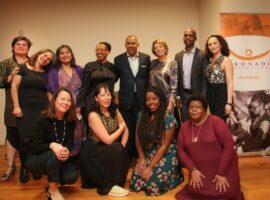 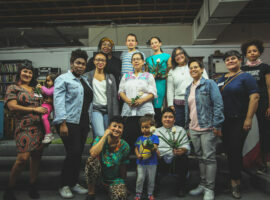 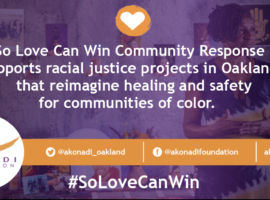 FOR IMMEDIATE RELEASE August 14, 2018 Akonadi Foundation Launches Third Year of #SoLoveCanWin Community Response Fund Funding will support efforts that create healing and safety in Oakland’s communities of color Oakland- Akonadi Foundation announced today the third year of the So Love Can Win Community Response Fund to support and seed racial justice projects in Oakland that reimagine, as well as lift up, healing and safety for communities of color. 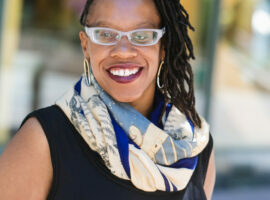 By LATEEFAH SIMON | PUBLISHED: 9/28/2017 East Bay Times The past few weeks leave no question that hate and bigotry still plague our country, and that our communities must continue to stand strong and united against racism. 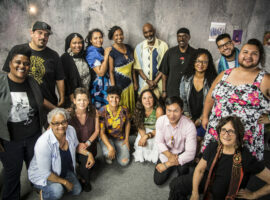 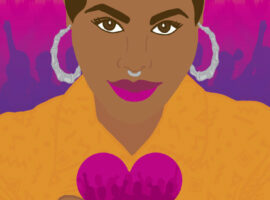 Akonadi Foundation’s ‘So Love Can Win’ Rapid Response Fund now open and accepting applications on a rolling basis August 15 through November 15, 2016.